I’m not sure when I first became really aware of the impact of stereotypes, but it might have been when I moved to England in the early 1980s and many people called me ‘the Yank.’ I’d never thought of myself as a Yank in any way, shape, or form, especially with an English father who cautioned me against the dangers of a Philadelphian accent. But ‘the Yank’ I became and with that moniker I acquired the baggage of what some English thought Americans represented. They were rich, big spenders who flashed their money around. I wore charity shop clothes and re-knitted pullovers. Or they thought American cities were crime ridden and everyone toted a gun. I’d only ever seen a gun in a policeman’s holster. The experience sensitized me. Back in America my family had expanded to include various in-laws who were Thai, Cuban and a half Native American and I learned about their own experiences of stereotypes. The subservient Asian wife, the hot-tempered Latino and the noble Indian maiden with braids were repeatedly plastered upon my in-laws and shaped people’s interactions with them. My in-laws in turn ridiculed these images, were angered by them or ignored them but underneath it they just wished to be judged as people first. In the case of the stereotypes imposed on my Native American sister-in-law there was a long history of images dating back before Hollywood, to the literature of the nineteenth century. Authors like James Fennimore Cooper who created a world of the American frontier that he had never visited, and peopled it with the likes of Uncus and Chingatchgook, two noble warriors who represented the disappearing wilderness. Longfellow harked back to these purer, days too with his poem, Hiawatha which described the noble warrior who stood stoically silent and the Indian maiden with her fringed buckskin dress. These images were all created in the face of the rampant industrialization that some feared had ruined the landscape and severed man’s vital relationship with the wilderness and in doing so, became greedy and self-serving. Indians, they felt, with their ‘instinctive’ connection with nature, had a natural affinity to it, and through either imitating or associating with Indians, the white man could recover his more wholesome self. In the areas of America where the memory of frontier fighting was fresh dime adventure novels took off. The Indian men that populated these works were the warriors who scalped innocent women and children. The Indian women dragged after their men clad in blankets and hauling goods or papooses. They all spoke in chopped sentences or uttered words like ‘ugh’ and ‘how.’ When film took over, Hollywood used all of these images countless times in their films down through the years and after a brief spell of using Indians in Indian roles soon substituted white men and women with ill-fitting wigs and dark makeup to act in the roles so that, with a few exceptions, not only were the images inauthentic, but the actors playing them were as well. These stereotypes affected people’s perceptions of any real Indians they encountered and burdened the Indians with expectations that were either to one extreme or to the other. In a rural community or town setting it compelled Indians to prove they were exceptions to these stereotypes rather than an ordinary person who had good and bad qualities just like everyone else. As I began writing in the 1990s I had my in laws to answer to, and with them looking over my shoulder, I was always conscious that should I bring in a person of different race or culture I would rely on individual attributes rather than stereotypes to form the character. My forthcoming biography of a Canadian Indian woman, Anahareo: A Wilderness Spirit, explores some of these Indian stereotypes and their impact on Anahareo during her life and her own response to it. Though she advocated for wilderness preservation with her British born partner, Archie Belaney/Grey Owl, there was no sign of braids or buckskin dresses in her attire. She had bobbed hair, wore breeches, lace-up boots and a scarf tied stylishly around her neck, and could hold a cigarette with the grace of Bette Davis. The main focus of my biography was easy—she did all the work for me. In my novel, Selkie Dreams published in June, cross cultural relationships and stereotypes are also a feature, but this time the onus was on me to present convincing characters. The main character is a young Irish woman who feels herself an outsider in her own nineteenth century Protestant world and seeks escape as a mission teacher among the Tlingit Indians in the Alaskan wilderness. There her own preconceived ideas are tested as she becomes acquainted with various Tlingit and white people in the mission area: the staff at the trading post who have their own notions about Irish; the military who serve in those waters; miners who pass through; the Tlingit who have converted and adopted white ways, and finally, the more traditional Tlingit. They in turn show their own notions about her and her mission work. In creating authentic people and authentic responses in both books I tried to draw on my experiences and research of original documents as well as my discussions with my relatives. The real test will come when they’re both published and the wider community gives their response. Kristin Gleeson is a writer, musician and painter who lives in West Cork, Ireland and has published historical essays in America, Canada, the U.K. and Ireland. Her debut novel, Selkie Dreams, will be published by Knox Robinson Publishing in June and her biography, Anahareo: A Wilderness Spirit, will be published by Fireship Press also in June. For information see her website: www.kristingleeson.com. Anahareo: A Wilderness Spirit, will be published by Fireship Press, June 1, 2012 and Selkie Dreams, will be published by Knox Robinson Publishing, June 7, 2012. Kristin, I can't wait to read about Anhareo. 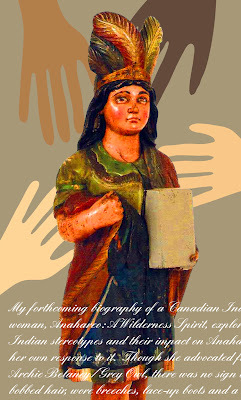 My mother was an early member of Woodcraft folk and she knew Grey Owl's book by heart as a child. I'm Australian and of of course that must mean I surf, drink truckloads of beer and skin crocodiles alive! And now I live in Italy where of course my neighbours are all Mafiosi dressed in Dolce & Gabbana..